Warm weather is here, and it’s time to store your leather boots away for the summer. If your boots aren’t stored in your closet the right way, they can be damaged – proper boot storage is essential to the life of your footwear, especially leather. Leather boots are difficult to keep in perfect condition, but if you store them the proper way, they’ll look brand new season after season. Before you store your leather boots away for the summer, make sure they’re clean. Get rid of any debris or dust that would sit on your boots inside your closet for an entire season. Use a toothbrush or boot brush to remove any visible dirt, but avoid using water to clean them as it can leave marks and stain the material. If your boots have any spots or stains, use leather cleaner (found at most shoe stores or online) to lift the stain without causing further damage. Once you’re certain your leather boots are clean, the next thing to consider is how to maintain their shape. When you throw your leather boots in a messy pile in the bottom of your closet, the leather folds and creases every which way, making your boots look old and your closet look messy. To avoid creases in the leather, make sure you store your boots in their natural shape as if your foot and leg were inside them. You can attempt to shove crumpled up plastic bags or old egg cartons inside your boots, but even that doesn’t maintain the leather’s true integrity. 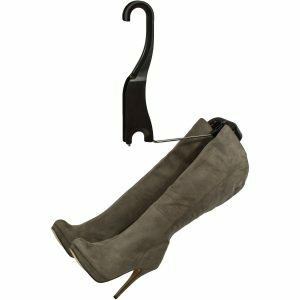 Boot Butler’s boot hanging rack has an innovative modular design that perfectly maintains the shape of your boots, especially leather. The rack’s feet and legs go inside your boots to keep their shape perfect without causing creases, marks, or folds. Leather boots are extremely easy to damage, and any traditional boot clip or hanger will most certainly leave a mark and make them look old. If you want your favorite pair of boots to remain flawless just like the day you bought them, do not use boot clips. Boot Butler protects your leather boots from creases, marks, and indents with our innovative design that hangs boots without damaging the integrity of the leather. 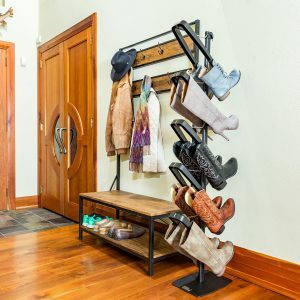 When you store your leather boots away for the summer, use Boot Butler’s hanging boot rack to keep your boots looking brand new!